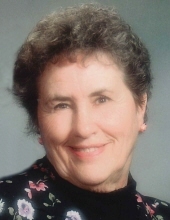 Shirley M. Gerarden, 82, De Pere, passed away peacefully on Thursday November 22, 2018. She was born July 12, 1936 to the late Alfred and Alberta (Gevers) Keyser. On November 14, 1953 she married Raymond “junior” Gerarden. Shirley was a homemaker, and after Ray’s retirement they built their retirement home in Crandon in 1988. An avid reader, she also loved music and collecting antiques. Along with Ray, she enjoyed attending the annual Hodag Festival in Rhinelander every year. Shirley’s family meant everything to her, and she loved spending time with her grandchildren. She is survived by her children; Laurie Gerarden, Keith (special friend Marie) Gerarden, Scot (Christine) Gerarden, Eric (Laura) Gerarden, Connie (special friend Roger) Gerarden, Evelyn Gilgenbach, Ten grandchildren; Christopher, Kyle (Becca), Danielle (special friend Clinton), Molly (Ian), Joshua (special friend Katrina), Alyssa (Patrick), Kathryn (Brandt), Samuel, Alana, Nicholas (special friend Heather), one great grandchild; Luna, as well as numerous siblings, and in laws, as well as nieces, nephews, and friends. She was preceded in death by her husband Raymond, as well as siblings, and in laws. Friends may call at Ryan Funeral Home 305 N. Tenth Street De Pere from 4:00PM – 7:00PM Wednesday November 28, 2018. Visitation will continue after 9:30AM Thursday at Shrine of the Good Shepherd Mausoleum at Nicolet Memorial Gardens, until time of service at 10:30AM. Entombment to follow. Please go to www.ryanfh.com to send online condolences to the family. Special thanks to Unity Hospice, for all of their care and concern. To send flowers or a remembrance gift to the family of Shirley M. Gerarden, please visit our Tribute Store. "Email Address" would like to share the life celebration of Shirley M. Gerarden. Click on the "link" to go to share a favorite memory or leave a condolence message for the family.